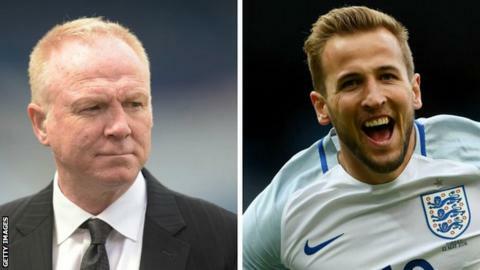 Scotland must keep England striker Harry Kane quiet and be strong defensively to win Saturday's World Cup qualifier, says Alex McLeish. The former Scotland boss says nullifying England's attack at Hampden will prove key to their chances. "We have to shut the door at the back. That's been our Achilles heel in a lot of qualifying games over the past two years," he said. "Keeping Harry Kane quiet is another job - that's what we have to do." Gordon Strachan's side are fourth in Group F at the midway point of the qualifiers. With five games played and with a record of two wins, a draw and two defeats, Scotland, on seven points, trail group leaders England by six, Slovakia by two and Slovenia by a single point. McLeish added: "I don't think a defeat is necessarily the end of Scotland but we're not looking at a defeat - we're looking at a famous victory."